If you don't have one already installed, you’ll need to install a fresh Laravel application. A guide on how to set up Laravel can be found in the official Laravel documentation. Login into your Automate.io account and click on APPS menu. A new page is loaded. Select Asana from the list. Opens a pop-up window. Click Authorize to create the app. To test locally, we need DNS software like ngrok that assigns a local port a publicly accessible URL over the Internet. Once ngrok is set up, run the command below to expose our local web server running on port 8000 to the Internet. The next step is to create bots in Automate.io that will be triggered by task-related events in Asana. Navigate to the BOTS menu and click on the “Create a Bot” button. Click the Select Trigger App dropdown and select the Asana app we created earlier. From the secondary dropdown, select “New Task” as the trigger event. Then, select the project you want to use from the dropdown. In the select panel, click “Select Action app”. 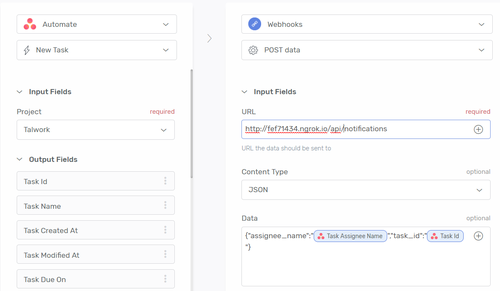 Enter the Webhook URL (your ngrok URL) followed by /api/notifications and the content type as JSON. Now drag and drop the Task Assignee Name and Task Id output fields from the first panel into the Data field. Create the JSON data as shown in the picture below. Click Save and then activate the Bot. Create a new bot and select the Select Trigger App dropdown. Choose the Asana app. Select “New Comment On Task” as the trigger event. Now select the project you want to use from the dropdown. In the second panel, click Select Action app. Select Find Task as the trigger event. Select Workspace followed by Project. Select Task Id from the variable list in the Task Id Field. In the third panel, click Select Action app. 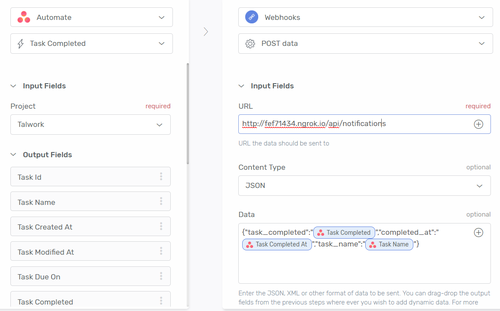 Select “Webhooks” from the dropdown followed by “Post data”. Drag and drop Comment Created By Name, Comment Text and Task Name output fields and drop them in the Data field. Select “Task Completed” as the trigger event. Drag and drop the Task Completed, Task Completed At and Task Name output fields from the first panel into the Data field. 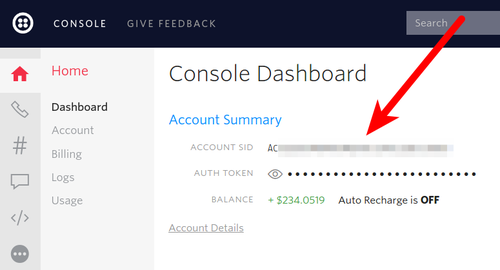 Login into your Twilio account and go to the console numbers page. Click the plus button to purchase a phone number if you don't have one already. You'll use this phone number as the "From" phone number when sending notifications to project members. Remember to also retrieve your account credentials; specifically the Account SID and Auth Token. These variables should be assigned the credentials retrieved from your Twilio account in the step above. 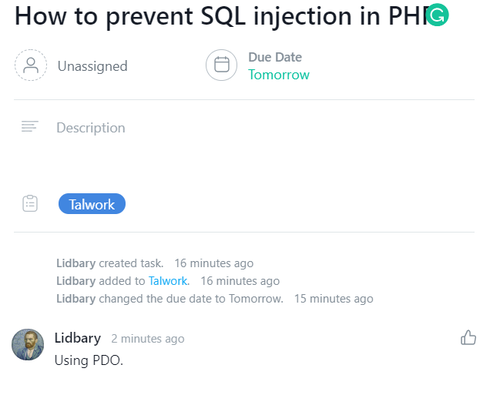 Finally, let's create the webhook we need to send notifications. login into your Asana account and create a task. You should immediately get a notification through SMS. Next, comment on the task we just created above. You should get an SMS similar to the one shown below. Lastly, mark the task as completed in Asana to get the task completed notification. You should get an SMS notification on this too. Asana API has a lot more features. Task-related APIs and webhooks covered in this tutorial are just a part of it. To get more details on Asana API, check out their documentation. The complete code for the tutorial can be found on Github. You can reach me at info@talwork.net or on Twitter at @mikelidbary.